Are you considering filing for bankruptcy? The decision to declare bankruptcy should never be taken lightly, although this may be the only option for many people struggling with their finances. Seeking the help of a qualified bankruptcy attorney can help you understand the best options for your specific case. Declaring bankruptcy could potentially save you and your family from losing the house, the family car, and other important assets. Make sure you know the bankruptcy pros and cons before you make a decision. While bankruptcy can cause certain disadvantages, it may be the best decision for the right individual as filing for bankruptcy can open many opportunities for those who struggle financially. It can ease financial difficulties and be a supportive mechanism for a easing emotional stress. The following are some of the most common benefits and difficulties that you will face when filing for bankruptcy. The process of filing for a bankruptcy can give you peace of mind. Whichever form of bankruptcy you are considering filing for, doing so can ensure that you will be able to recover and focus on creating a new path going forward. Additionally, filing for bankruptcy can put a stop to the some of the letters and phone calls from creditors via the automatic stay. These forms of harassment can occur at many hours throughout the day and can also happen at your home or place of work. Filing for bankruptcy can offer you a solution of a seemingly endless financial worry. In many cases, bankruptcy is not an easy, single step process. Even after filing the bankruptcy case, the filer needs to follow certain rules. For example, if an individual receives some form of inheritance, he or she will risk having the relief rescinded. Further, some forms of bankruptcies will require debtors to make ongoing monthly payments. Failing to make a payment can cause severe problems for the individual seeking to recover from his or her financial distress. Without a doubt, filing for bankruptcy can provide financial management, but filing will also require commitment and even lifestyle changes. Completing the process, while difficult, is nonetheless possible. If you are considering filing for bankruptcy, speak to a qualified attorney who can guide you through the process and help you understand the best solution for your financial dilemma. 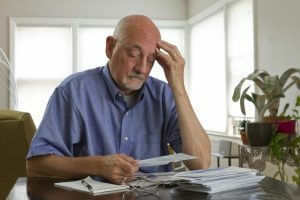 Undergoing financial distress can make just about any person feel disappointment and pressure. Due to the stigma, many people will delay the process of filing for bankruptcy. Unbeknownst to many, however, filing for bankruptcy can help people maintain a certain baseline. If you are considering filing for bankruptcy, bankruptcy can protect some of your assets, which includes your home. Being able to keep your home can offer you and your family a minimum baseline and a quality of life. It helps to know that you will not be left out on the street by filing for bankruptcy. Often, vehicles are also protected when filing for bankruptcy. This can help you continue to get to work, which is helpful to your creditors as keeping your job will likely mean that you will be able to repay them. It is difficult to repay creditors without maintaining a baseline, and most creditors understand this. Certain forms of bankruptcy allow you to continue to be productive. Filing for bankruptcy can be hard for many people because it means that they will have to change their spending habits and make drastic lifestyle changes. After filing for bankruptcy, you will need to give up your credit cards. In today’s society, not being a credit card holder can affect various personal practices. Filing for a bankruptcy can also affect your ability to apply for many types of loans or lines of credit. A bankruptcy can appear your credit report for ten (10) years. While a bankruptcy can reflect negatively on your credit report, it is certainly sets the tone for recovery. If you are able to make positive changes in your credit score while you are undergoing a bankruptcy, this can definitely be beneficial for your overall credit appearance. Filing for bankruptcy can offer solutions to a problem you might not have been able to solve otherwise. Speak to a qualified attorney in order to determine if filing for a bankruptcy is the right path for you. Is Filing for Bankruptcy the Right Solution for You? When determining if filing for bankruptcy is right for you, seek the advice and guidance of a bankruptcy attorney. Speaking to an attorney can walk you through the bankruptcy pros and cons so you can make the best decision. Filing for any form of bankruptcy should never be taken lightly. While bankruptcy does present a few setbacks, it can nonetheless offer debtors the opportunity to make a recovery and ultimately clear the way for new beginnings.